1) You can use your credits for prepaid recharge, postpaid bill or DTH & datacard recharge. These credits must be used only on your transactions on the Niki App. 2) The number of credits that you can use is a maximum of 25% of your transaction amount. For example, if you recharge Rs 100, you can only use 25% of 100 = Rs 25 worth of your credits. You will pay just the remaining Rs. 75! 4) You will receive a code on it. 6) Now enter your details. 7) Enter the invite code which you got via SMS. 8) Now use this referral code to get Rs 10 joining bonus. 10) Now click on Menu and get your referral code from Refer And Earn menu. 11) Share it and earn Rs 10 per referral. 1) On the homepage click on Recharge. 2) Now they will ask details. 3) Give them and enter the amount. 4) You will get the recharge instantly. i.e can i use this in rooted bluestack sevral times or not….. Try it.. I am not sure about this. How to check balance in the app? Sir what is the minimum money we need in the account to make a Recharge ? On Homepage you need to click on recharge >> then enter number amount etc. Restart the app n try again. Looks like There bank balance is Rs 00 now. How to transfer to paytm? You Cant Transfer Credits in Paytm. My Reder code is rik. Use it if required . hey yash maine past 3days phele slonkit pe a/c bnaya with ur referal code and add money 200 or uske baad card active click krne pr process show kr rha tha lekin ab 3 days baad wo active ho gya bt wo expiry date nd yr mujh se maanta hai….even 16 digit no. are not showing….ab kya procedure hai…. 16 digit & expirey you will received by courier within next 10 days.. I request you to provide any detail that you want to change in your current order. Is mesg k baad kya krna h?? i have not received this type message from this App. i didn’t get my recharge?? what’s a error…. Yashveer bro apka site me agar comment korta hu to uska time q alag hota hay? Main 4 pm comment korta hu uska timing 10am q dikhata hay? Others site me to sahi time dikhata hay.pls fix it bro. The App Is Redeeming Only Rs. 2 From That. And We Have To Pay The Remaining Amount. dont recharge.. they say “your redeeming is 0” why? 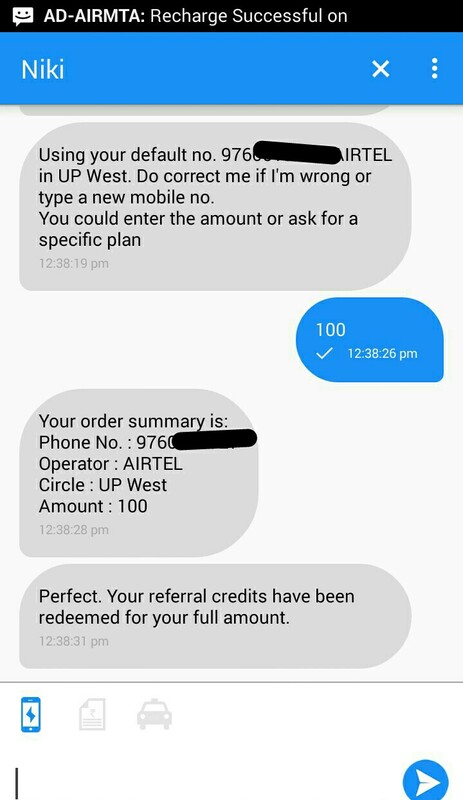 Use my latest refer code to get Rs 10. You can use your credits for prepaid recharge, postpaid bill or DTH & datacard recharge. These credits must be used only on your transactions on the Niki App. The number of credits that you can use is a maximum of 25% of your transaction amount. For example, if you recharge Rs 100, you can only use 25% of 100 = Rs 25 worth of your credits. You will pay just the remaining Rs. 75! So, in total you can redeem Rs. 100 discount on total transactions of Rs. 400 on the Niki app. Bkwas app hai….dont install it………. They change their Terms & conditions. Now you redeem 25% of your earning and 75% need to pay using yout Bank account..